Are you involved in 6-10 “high stakes” planning sessions per year? Do you roll your eyes to the back of your head when you think about sitting through another…worthless…planning…session? Time = money…flushed down the drain. 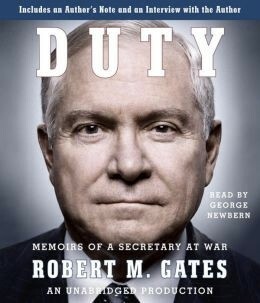 Even Bob Gates, Secretary of Defense under Presidents Bush and Obama experienced the same as you. “I found the NATO Meetings excruciatingly boring. The French defense minister confessed to doodling to pass the time during meetings and then outed me for doing crossword puzzles.” Page 194. There may not be hope for the former Secretary of Defense. But there is for you. Members of your group say they’ve never done more productive planning. Hard to believe? Doesn’t have to be. Stay aboard so you won’t have to spend never-ending hours in worthless wandering meetings…that go nowhere…except to schedule…more unfocused planning sessions. After graduating from The University of St. Thomas in St. Paul Minnesota my first job was selling religious education programs for the Archdiocese of St. Paul and Minneapolis. I called on church boards night after night after night. Normally I was put on the agenda last or close to it so I sat through lots of meetings. Sometimes I’d have to wait until 10:00 pm to make my “pitch.” Endless reports. Wandering discussions. People dozing.You’ve been there. Then I entered the business world where I knew meetings would be…SOOOO…much better than the church world. I’d get so upset at our Chamber board of directors. I couldn’t understand how individually they could be so smart, but as a group I thought they made lots of dumb decisions. It wasn’t that my board was incompetent. So I became like an anthropologist. Studied planning meetings, decision-making meetings. Zeroed in on “high stakes” planning and the dynamics of such groups. Even my aunt, Sister Terence McNellis, a Catholic Franciscan nun contributed. She taught me a system for making sense of boards of directors meetings. After learning and using her system called Boardsmanship…we taught it at the Minnesota Chamber of Commerce Executives Convention. Boardsmanship was so well received that afterwards we received invitations to teach it all over the country. Then I heard Mike Vance, Walt Disney’s Director of Idea/People Development. Mike was the first Dean of Disney University. During his six-hour seminar he shared radical ways they did planning and “meetings” at Disney. I hit pay dirt in my anthropological search. The mother lode. The big bonanza. Over time I weaved together what I learned from Mike about movie, theme park and project development at Disney and tied that with my strategic work with boards of directors. Then I knitted all of it together with my years of “idea development” to create The McNellis Compression Planning® System. Thousands of hours in developing Compression Planning are condensed here so you can easily see if it’s a good fit for you. One Monday morning in February, 1974, two men came into my office for help. They were in charge of raising money for Pacelli Catholic High School, in Austin, Minnesota. Pacelli was in dire financial straits. The year before they did all the traditional things to raise money: 4-color brochures. Cocktail parties for the wealthy people. Typical ways to raise money. They raised $60,000. Spent $40,000 and took 3 months to do it. We conducted the first full use of Compression Planning to save Pacelli. Our team worked for 11 days, culminating in a 3-hour campaign. Raised $640,000. Spent $900 doing it. (Yes. Nine hundred dollars). Convert the $640,000 from 1974 dollars into 2014 money to give you perspective: $3,228,384. That Pacelli fund drive LAUNCHED Compression Planning® (CP). How other leaders used Compression Planning. Compression Planning helped Sinclair Community College, OH, win more than $163 million in grants over the last 21 years while producing better proposals 30% faster than their competition. For the last 14 years they have achieved a 40 to 1 Return on Investment (ROI) for their Grants Department (40:1). A panel of Admirals and Generals from 5 branches of the military had to decide how to allocate $40 million in medical research funds for military women. Can you see the squabbling, the power grabs, the backstabbing? This went on for 18 months. One Compression Planning grad was on this panel. Before resigning in sheer frustration, he volunteered to lead the planning himself. Two Compression Planning sessions later, all 5 branches agreed 100% on projects that cut across the entire military. And their first project was jet pilot suits – from helmets to boots – designed especially for women. The CFO of a major health care system told Compression Planning Institute alum Garrett Trumpower of Medseek that the reason they won a $9 million contract over IBM for the hospital’s new portal system was because they “out-listened” their competition. Their “listening system” was Compression Planning. Three Short Stories From Over 500 Mega Challenges Our Firm Led for Clients. Armco’s new $80 million steel mill was hemorrhaging cash, losing more than $1 million a week and threatening to bury their entire corporation. A young super-star manager took over and in his first week on the job brought in McNellis to lead a one-day CP session. Two weeks later the mill stopped bleeding. It became the most profitable mill in their company. Risking every penny they had, the leaders of a national distribution chain were about to make a disastrous move and sink their company when they called in McNellis. In 1½ days they found two simple solutions – one for less than $200. But the hitch was – they had to cut out the back-stabbing and act like grown-ups. In 48 hours they stopped their turf wars and 3 weeks later saved their company. Facing their most competitive threat in 108 years, Shamrock Communications brought in McNellis to lead their top 35 managers in a two day CP session. They had 48 hours to come up with a bold response to keep their primary income producing subsidiary from being demolished. 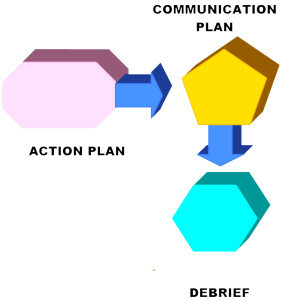 The storyboard system, based on the Disney approach to planning movies, is a key element of Compression Planning. Storyboards of Disney’s time were sketches and drawings. CP storyboards are mostly words, graphics and artifacts. Yet most meetings are overwhelmingly “audio” – sitting back and listening to someone talk. 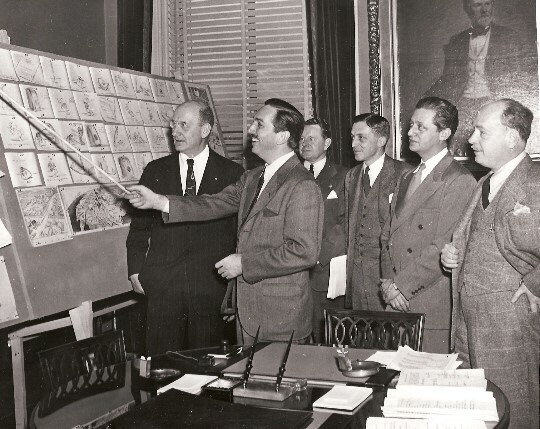 Walt Disney briefing team members of a project. Compression Planning using storyboards provides you an opportunity to work at a speed you can only imagine. Once you start using CP, you’ll find that typical “talk-it-to-death” redundant meetings will drive you nuts. The storyboard CP system gives you flexibility, speed, creativity, focus, and buy-in. This simple model will take you through 80-90% of the opportunities and problems you face. When you learn CP you’ll be able to use and adapt this model to your strategic and day-to-day planning needs. CP sessions are DESIGNED, not “thrown together” as so many meetings are. Our CP model will help you evolve clarity around your issues. You’ll find it saves you immense time addressing challenges with groups. What follows will be a “quickie” lesson in using Compression Planning. Pat McNellis – Compression Planner extraordinaire – will demo for you. Pat is director of Idea Implementation as well as a senior coach and facilitator for our company. Pssst: He’s also the father of 3 of my grandchildren. 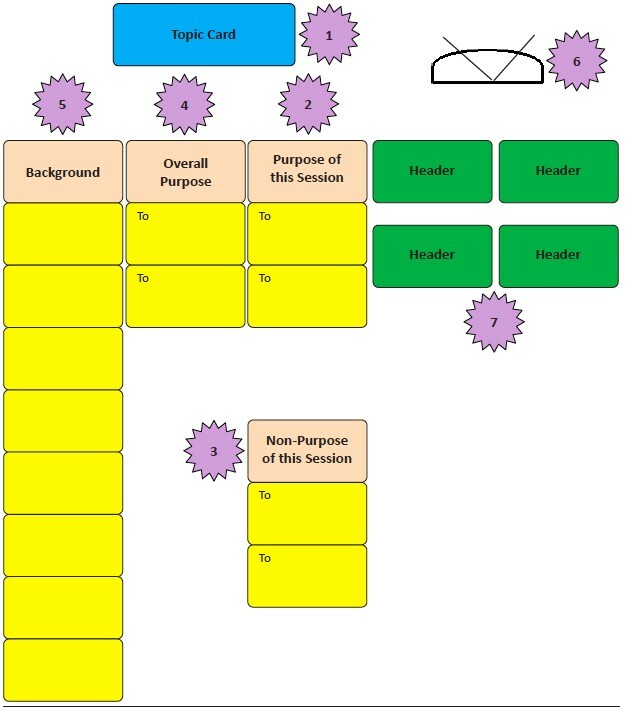 Use this template 3-4 times and your planning sessions will never be the same. The following videos will dissect each section the McNellis Master Planning Model. Double click for a sample CP session. Don’t get hung up on the content of the session. It’s strictly to show you a sample of “HOW” a session goes. Everything is set in front of participants. Storyboards set. Notice the artifacts on the storyboards. Participants walked into a room where the TOPIC was ready to be worked on. Compression Planner (Pat McNellis) leads the session. Pat orients them to CP. He reviews the Guidelines. Posts the Guidelines. Everyone is ready to give their ideas. Next Pat demonstrates how to facilitate the exploration of ideas. Note he uses two different techniques. In this clip, you’ll see how the group focuses on actionable concepts. They narrow down from lots of ideas to the CRITICAL FEW. This last clip outlines how to develop. . .
a Debrief of your Compression Planning Session. Here’s what a modern Compression Planning session looks like. Before starting your own project or meeting with a client, study the Boundary Questions that will help you design your session. Ask your client in your interview. Answer yourself if it’s your project or issue. Feel free to study examples of different types of designs to give you ideas. They range from a simple 80-minute focus group to a two-day retreat. If you’ve read this far, I have a hunch… you spend VAST amounts of time doing business and organizational planning. You’re frustrated with traditional approaches that take forever. We have (a lot) more to share with you, whether you’re leading strategic planning, project planning, or focus groups. Hope to see you on the inside. We’ll be “spilling the beans” so to speak, in the privacy of your inbox. We prefer intimacy over a public website. That’s just how we prefer to roll. PS – Involved in at least 6-10 “high stakes” planning sessions per year and looking for a new approach? Join me. We’re going to explore fascinating “territory” from the innards of organizational life. Working with collaborative leaders deeply engaged in moving big ideas forward is my specialty. Hope we meet. Build consensus and ownership behind plans which has stickiness . . .